How a Fun Wedding Looks Like! DJ Entertainment! On September 2, 2017, I was the DJ and MC for Jaime & Bradley's wedding at The Grand in Long Beach, CA. It was a fun wedding of about 250 guests. 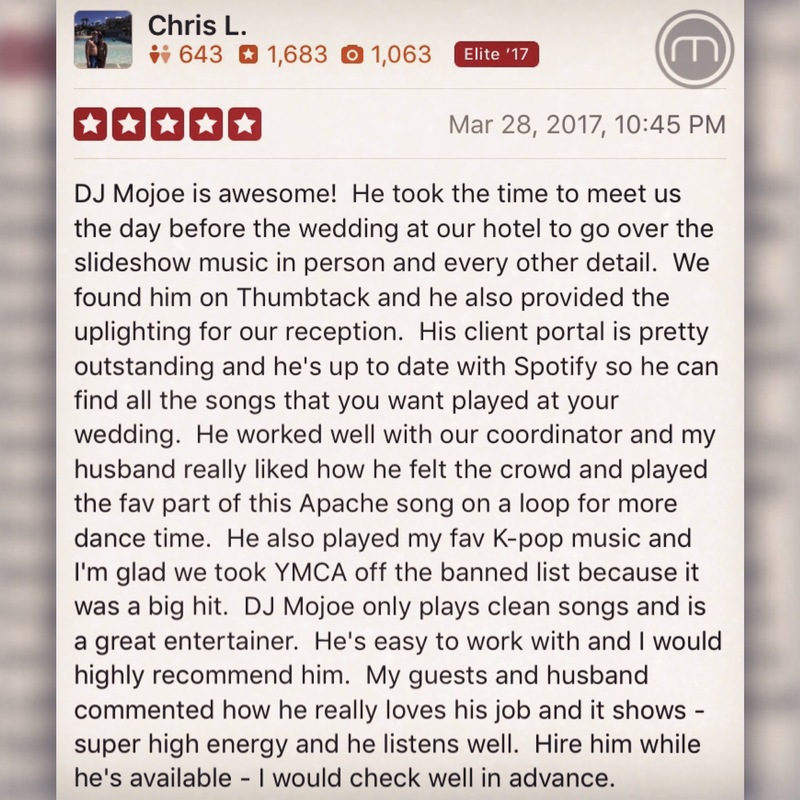 I provided sound and microphone for their ceremony, music for their cocktail, and DJ/MC entertainment for their reception. It was a very fun and upbeat wedding mostly because of their music selections that they've chosen for their wedding. They even had a special performance from their cousins. Overall, the dance floor was packed! And everybody danced the whole night. I'm glad I was able to capture some highlights of people dancing and some of my song mix transitions. This is the kind of weddings I enjoy performing. Thank you, Jaime and Bradley, for having me as your DJ! On March 26, 2017, I DJed and hosted at one of my favorite venues, Calamigos Ranch at the Oaks Room in Malibu, CA. This time it was for the wedding of Christine & Nathan. I was in charge of their wedding ceremony, cocktail, and reception. If you've never been here, it's an amazing place tucked in this hills of Malibu. At this particular venue and room, the ceremony is placed right in front of a beautiful curved waterfall which creates a serene scene as the couple gets married. Shortly after the ceremony, guests enjoyed the cocktail hour outside on the patio. For the reception, I gathered everyone inside and asked to position themselves around the dance floor as we welcomed the wedding party and the newlyweds. It was a fun grand entrance and set the tone of the night. We continued with the first dance, blessing of the meal, dinner, speeches, a slideshow presentation, parents dances, dancing and cake cutting. One of the things I enjoyed that night was mixing in some K-Pop, Korean Pop, music for the bride and her family/friends. I also worked with a great team of vendors who all made the night smooth and fun. Overall, it was an amazingly fun night! Thank you Christine & Nathan for having me as your DJ!